These are hard times for the liberal Zionist group, J Street. It had bet all its money on a horse named Hillary to win the election. It expected for the next eight years it would serve the same role as it did during the Obama presidency (i.e. “Jews for Obama”). Her ignominious loss upended J Street’s best laid plans. As it never took to Bernie Sanders and has no affinity for his insurgent politics; and as the Democratic Party is in deep disarray, J Street faces four years in the political wilderness. As a result, it’s making some mighty strange political choices. This week, the Israeli government hosted its annual anti-BDS student conference at the UN. In past years, pro-Israel donors even paid for students to attend. 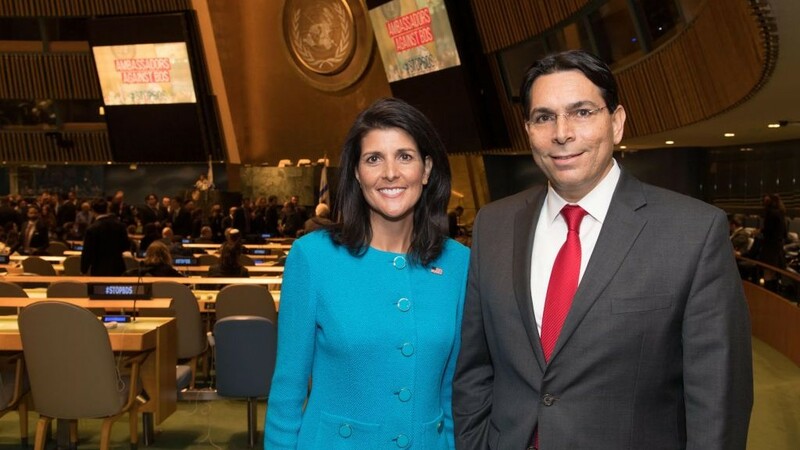 Among the keynote speakers this year were Trump UN ambassador Nikki Haley and Israeli UN ambassador, Danny Danon, a darling of the far-right Likud Party. Every day, estab Jew ldrs tell me J Street shd do more re BDS. When @jstreetu attends UN Summit, gets called anti Semitic, where’s estab? Really, Jeremy, you expect Malcolm Hoenlein or Danny Danon to come to your defense? What are you smokin’? All I can say is that the Likud, Donald Trump and J Street make mighty strange bedfellows! Apparently, J Street U activists in the hall were abused by pro-Israel activists. They were called nasty names. Even “anti-Semites!” And by a U.S. Congress member no less! What did they expect? That the Israel Lobby (which they’d join in a heartbeat if it would have ’em) would embrace them with open arms? J Street’s “sell-out” of progressive values is multi-fold. First, it has made common cause with the Trump administration and Likud government, which betray not just progressive values, but liberal ones as well. It has set itself against BDS which is embraced by true progressive movements internationally. …The left-wing Jewish student organization plans to introduce a bill for ratification which calls for a two-state solution — and for investment and philanthropy in both Israel and the West Bank. While If Not Now was chaining itself to the doors of the DC Convention Center to throw a wrench in the Aipac conference, and its activists were being beaten to a pulp by JDL thugs, where was J Street? Cozying up to the rancid apparatchiks of Likudism and Trumpism at the UN. Yesterday, a Palestinian-American, 54 year-old father of four, Kamal Nayfeh, was brutally assaulted at the Aipac protest by thugs associated with JDL Canada. He required 19 stitches to close a gash caused by being struck repeatedly with poles bearing the flags of the U.S. and Israel. After falling to the ground, the attackers continued kicking him in the head. Another INN student activist was also struck in the head by a pole and sustained a concussion. JTA reports that these assaults have now been upgraded to hate crimes. The group’s Grand Wizard, Max Weinstein, who high-tailed it out of town just in time to avoid arrest, made this totally mendacious, self-serving video just before he departed for home from the DC airport. I’d like to know why this country needs JDL thugs crossing international borders to provoke mayhem and brutalize U.S. citizens? I spent last night asking Canadian media to cover this story. I haven’t heard of any such reports (though there may be ones I haven’t heard of). Shouldn’t the RCMP be interested in Canadian citizens who are such thugs and represent Canada so poorly abroad? After reading the poster for the Reclaiming Our Narrative speaking tour, one can easily see that, in comparing it to the ANC statement, it is a total fraud. It’s no surprise that the MFA would engage in such deception. But it is surprising that Jeremy Ben Ami would let himself be snookered in this way. I’ve tweeted asking him for a response. He has not replied. The African NGO whose logo is featured on the event poster, Africans for Peace, maintains a website which features anti-BDS statements purportedly written by South African Black students who were once “BDSers” and who’ve since seen the light. Another article is written by someone who once supported “one-state” but has since also become enlightened. In fact, the Israeli government paid for members of the group to attend the UN anti-BDS conference. Well-placed payola brings good hasbara. Good work man, keeping exposing these people. Just an observation – Yosef Steynovitz’s T-shirt shows the Otpor clenched fist. This symbol has been used throughout many of the so-called -color-coded’ regime change events in other countries, e.g. Ukraine. It is associated with organizations funded by George Soros’ Open Society outfit (amongst others including USAID, a CIA front). @Yonatan: Nonsense. If you’re not aware that the clenched fist has been Meir Kahane’s signature logo for decades you’ve been living in a cave. This is not a site for alternative facts. I was not aware of the Kahane link. 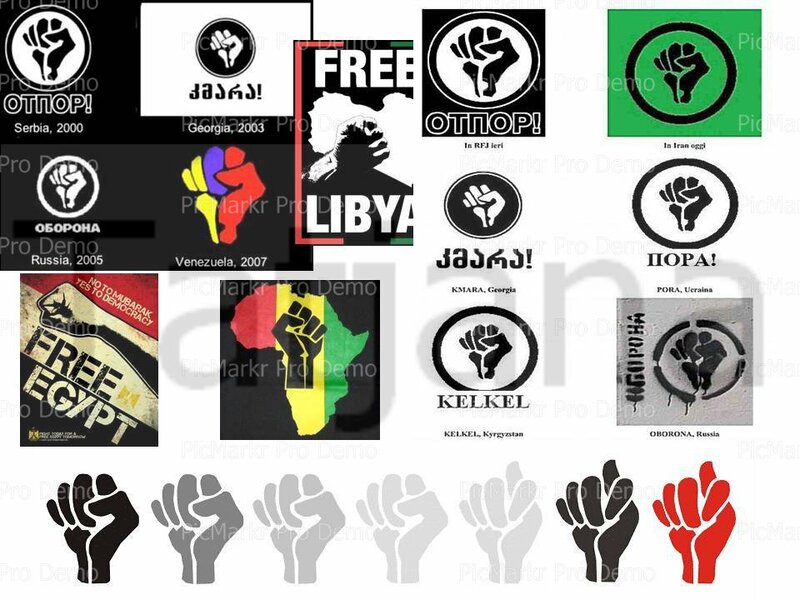 The use of the very same clenched fist symbol by Otpor is well documented. Perhaps those behind Otpor repurposed it. Finally, it is a mark of the man as to how he treats strangers. I notice your gratuitous insult and look forward to being banned from your commenting on your site. @ Yonatan: No one’s banning you. I just prefer comments grounded in facts if possible, rather than speculation.